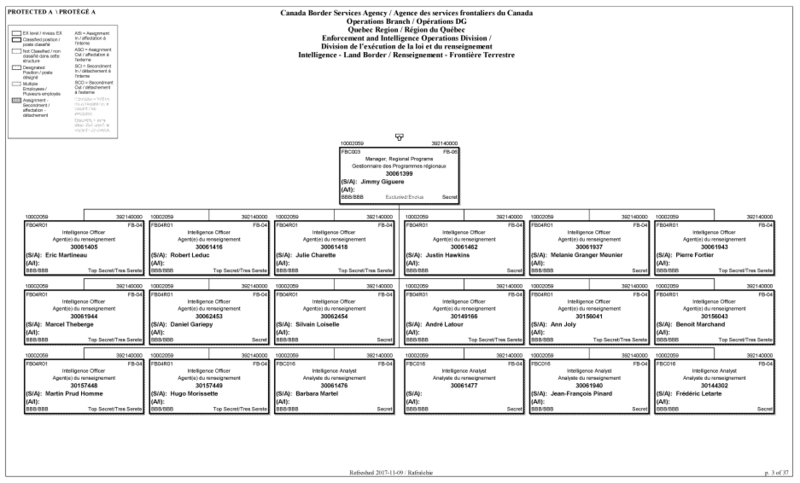 In advance of this year’s No Borders May Day, below you will find the name of every member of the Enforcement and Intelligence Division of the Quebec Operations Branch of the CBSA, categorized by job title. This information comes from the response to an access-to-information request that was published by the Twitter account @cdnati, to which we are unrelated. Those documents, linked here, contain the names of all CBSA employees across Canada. The organizational charts drawn from below are dated November 2017. We hope this information serves as a resource for a diversity of projects opposing border enforcement. Whether a particular ‘Inland Enforcement Officer’ or ‘Intelligence Analyst’ is an active white supremacist, doesn’t think much about politics and believes it’s a job like any other, or feels shame and remorse about their work, their continued activity in the CBSA puts migrants and migrants’ communities at risk. It should come as no surprise that people will identify these agents and make it clear that their role in a violently racist and colonial system won’t be tolerated. * These names are mostly already publicly available. III% Québec Member Caught Proposing Fake Terrorist Attack Rage for Lucy: Bring Her Back! No More Detentions and Deportations!